Rafael Nadal has revealed the surprising reason he prefers to play tennis in sleeveless shirts after demolishing young Greek star Stefanos Tsitsipas in straight sets to advance to yet another Australian Open final. As a young man Nadal became one of the pioneers to bring the sleeveless shirt to tennis but in recent times he has more often than not played in t-shirts. The biceps have been on show again at this tournament, with the intimidation factor of his massive guns becoming a discussion point as thoughts turned to why he had brought the old style back. 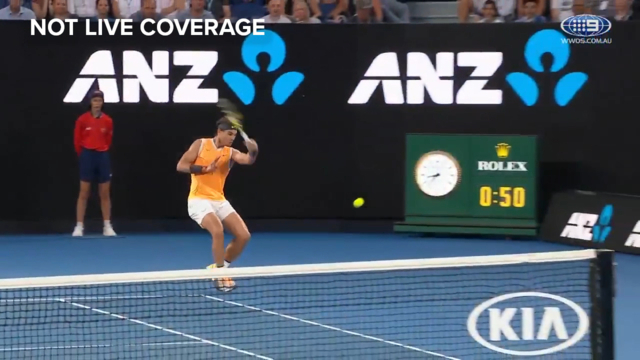 The question was asked by Channel Nine commentator John McEnroe immediately after Nadal's 6-2 6-4 6-0 semi-final win, with the Spaniard shyly batting away the intimidation theory and giving a more practical reason. "No, the real thing is I have, ah, small issue when I’m playing in the very warm conditions that when I hit the forehand, when I am hitting this strange shot (with the exaggerated follow through) I hit with the grip on the right arm," Nadal explained. "So under warm conditions, even if I played for a couple of years with the normal shirts, the polos, I like to play with the sleeveless now and a couple of years ago we spoke with Nike and, you know, couple of years without playing like this so was happy to go back to the sleeveless, makes me feel younger again." 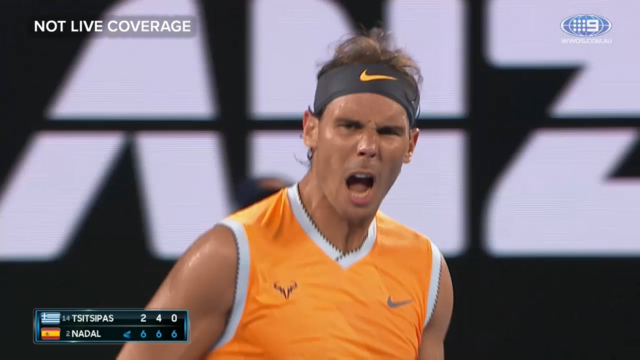 Not only is Nadal feeling younger, he's playing like he's 25 again. After struggling for the last couple of years to finish hard court tournaments due to chronic issues with his knee, Nadal has remarkably looked back to his brutal physical best in this tournament, bullying each of his opponents in the lead-up to his semi-final. With Tsitsipas having taken care of another all-time great, Roger Federer, in the fourth round, there was plenty who expected the 20-year-old to push Nadal all the way but after being broken twice in a nearly flawless first set for the Spanish champion, the youngster was unable to find his way back into the contest. A humble champion, Nadal was complimentary of his opponent as always, predicting Tsitsipas could win multiple grand slam titles across a long career. "I will not be the one to say no, he has everything to make that happen; good serve, good shots from the baseline, he’s brave, he goes to the net often so he has everything to become a multi grand slam champion," Nadal said. "When at that age he is in the semi finals that says a lot of good things about him and winning the matches that he won already I hope to face him in important rounds in the next couple of years hopefully." With Nadal first through to the final and with the unique privilege of having three days before his next match, he said he would have a relaxed day away from the tennis court on Friday before watching the second semi-finalists Novak Djokovic and24-year-old Frenchman Lucas Pouille slug it out on Friday night. In all likelihood it will be his old rival Djokovic there to meet him in the final on Sunday and with a string of hot Melbourne days on their way, Nadal said he'd be happy to face the Serbian with the roof closed. "Being honest, no, if it’s that warm I prefer to close the roof. No, I played some great matches here with the roof closed," Nadal said after McEnroe asserted the 17-time grand slam winner had better results with the roof open. First Djokovic has to get there and while Nadal favoured the orld number one to get through, he said Pouille would be a dangerous opponent for him. "Of course Novak is the favourite , he’s been in this position many times, for Lucas it’s the first one," Nadal said. "But Lucas won an amazing match in the quarter final, playing so well and I always thought Lucas is one of these players who has an amazing potential. He can win (sic) everybody when he’s playing well, so let’s see. "Novak is unbelievable so it will be difficult but it’s a tennis match and anything will happen and I will enjoy."